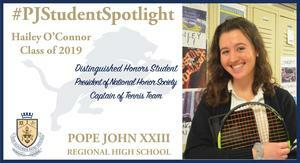 O’Connor is a senior who has demonstrated her great abilities while at Pope John. We at Pope John XXIII Regional High School want to share with you a new series called “Pope John Student Spotlight” in which we recognize our students’ talents and achievements! Today, we want to showcase Hailey O’Connor! O’Connor is a senior who has demonstrated her great abilities while at Pope John. She has earned Distinguished Honors in the classroom while taking courses such as AP Physics I, AP US Government, AP French, AP English Language, AP Psychology, and AP European History. O’Connor is also the president of the National Honor Society, president of the Key Club, captain of the tennis team, and a member of the Stand Against Bullying Club, SAT 1400 Club, French Honor Society, Math Honor Society, English Honor Society, and SEARCH Team. O’Connor has also earned a college acceptance to the University of Notre Dame.